Need professional clothes for the Illinois Tech Spring 2019 Career Fair, interviews, or other career fairs? Visit the Professional Clothing Closet to try out and get free professional-style clothes donated by Illinois Tech students, staff, and faculty. Career Fair Prep Night: Thursday, February 21 from 4–7 p.m.
Career Fair: Wednesday and Thursday, February 27–28 from 9 a.m.–3 p.m. If you would like to visit the Professional Clothing Closet before prep night or the career fair, please email Mehak at mhafeez1@iit.edu at least 3–4 days in advance. 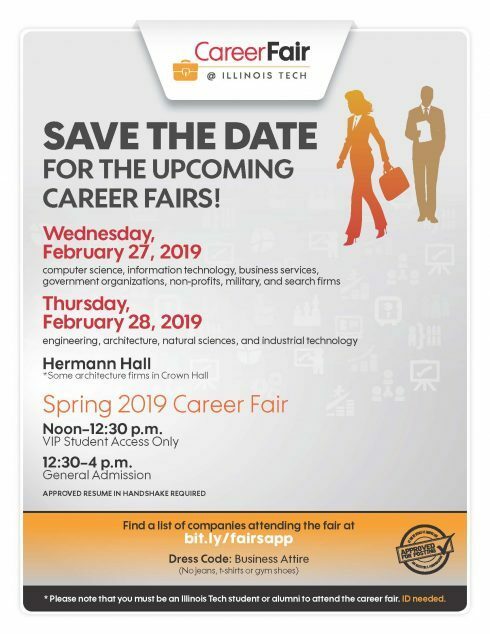 If you have any further questions, please email the Office of Career Services at careerservices@iit.edu.